A Dog bite injury can cause serious harm for the victim—who is often a child. Dog bites can cause permanent scarring, permanent injury and emotional trauma. Dog owners are responsible for injuries caused by their pet, meaning that they may be held liable for medical bills and other financial losses resulting from a dog bite trauma. They may also be liable for any pain and suffering caused by the dog attack. Send your Dog Bite Injury claim to a lawyer who will review your claim at NO COST or obligation. 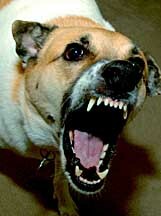 More than 4 million people each year are bitten by dogs - many of whom are children. Pet owners are legally responsible for the behavior of their dogs. In most dog-bite cases, the dog's owner will be required to pay for the scarring and disfigurement, pain and suffering, and all medical bills and lost wages associated with a dog attack. Most states have statutes making it difficult for dog owners to avoid liability for injuries caused by dog attacks. Sometimes the person taking care of the dog, often called the boarder, keeper or harborer, may also responsible. Unfortunately, a large number of dog bites cause serious injury to small children. Scars can be a serious, life-long result of a dog bite. Children are particularly susceptible to bites around the head and face and often suffer disfiguring scarring. Scars are more than physical injuries, also causing emotional injuries and fear. Scars may require plastic surgery which often must wait until the scar matures, usually about a year. In the case of a child, plastic surgery may need to wait until the child is finished growing after puberty. Scarring has a very real impact on self image and can have significant psychological impact. If you or a loved one has suffered from a dog bite, you may qualify for damages or remedies that may be awarded in a possible lawsuit. Please click the link below to submit your complaint. Survey finds dog bites costing homeowners in ..
Dog Shot After Dog Bite Injury, Too Late for .. I have suffered a deep bite on the left elbow, and nearly had my left thumb torn off. My toy Schnauzer suffered 14 puncture wounds to the head and neck, a fractured right leg, a slit throat and a deep bite in the right breast extending to her under arm. She was shaken like a rag doll to break her neck. She lost 7 teeth, and is in the hospital again to have her upper canine tooth removed and have the leg reset.